Lotus Notes to Word converter allows to convert NSF emails with attachments to Word file. The tool can scan, load and preview all emails from Lotus Notes NSF to DOC file. Moreover, the software maintains the originality of emails while converting into Word file. To open the Word file, Microsoft Office 2013 installation is mandatory. NSF to Word converter is capable to convert all the emails of Lotus Notes into Word document. In addition, the software allows to create an individual Word document for each NSF emails. The software is responsible for Scanning and makes a list of all the emails found within separate folders. This application performs a quick scanning mode on users complete .nsf file and loading all the folders in it. After scanning, the software creates an email preview and a status report instantly. The complete email folders will become listed and the software will display a number of data items within any particular folder including details. Lotus Notes to Word Converter safeguards all the associated Meta properties and attachments of NSF emails. It preserves all the information like To, CC, hyperlinks, inline images, and another formatting. 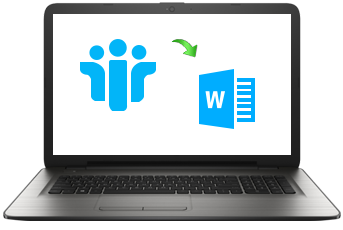 The easiest way to migrate emails from any specified folder into Word format. users can check or uncheck desired items or folders, which they need to export. This converter will export all the emails by default. A Complete Progress report of overall Lotus Notes to Word conversion status is shown with the name of an email folder, a number of items in a folder, current emails, the subject of email in Word document. Also, keeps the read and unread Status of emails. “The best part I really liked about this NSF to Word Converter tool is that its performance and its user interface during migration from save lotus notes email to word. For being a non-technical user, I can even export NSF files into Word format. I heartily want to appreciate the developer team who had created a wonderful solution. Thanks a lot." Lotus Notes to Word conversion solution is designed to transfer all the emails from NSF to DOC file. Moreover, technology changes with time and every user wants a comfort zone due to the presence of a high innovative interface. This tool helps to export Lotus Notes document to Microsoft Word assures that no harm to the attachments and email properties is done during the data conversion. Export NSF files into Word is a reliable and efficient solution for an Organization, which holds the versatility of .nsf emails. In the below section, we will discuss the reasons behind to store the emails of IBM Notes into Word document. Lotus Notes cannot allow to access all the emails after account termination. Therefore, this tool is the best way to save the NSF mails as Word document format. User can fetch NSF emails in .doc format at anytime and anywhere. After Lotus Notes to Word Conversion, users can explore them in another application like Microsoft SharePoint. It can be used by an Organization to store the files in .doc type which is possible to stay active and secure. Lotus Notes to Word software can be used to take a backup of the essential file in DOC format if users are going to leave their workplace. NSF to Word converter helps to scan all users data before migration to avoid the harmless entity. Tool Supports Batch Processing while converting emails from Lotus Notes document to Microsoft Word Format and also retain all Meta Data properties & attachments.